You and I both know the spoils from the GOP tax plan will go right into shareholders’ pockets—so let’s discuss how we can grab our piece of the action. And outsized dividends with 20% price upside to boot! It all comes down to zeroing in on companies that do 2 simple things. I’ll reveal what they are—and give you 3 terrific “tax plan buys” as I go along. But first, let me be clear that I’m not taking a side here: no matter if you think the tax plan is a masterstroke or a catastrophe, as an investor, you need to check your politics at the door and take a hard look at the landscape in front of you. The federal tax rate is plunging from 35% to 21%, as of January 1. Repatriation is happening: untaxed profits US companies are holding in cash and stock abroad can now be brought home at a lower tax rate of 15.5%. Repatriation alone could be a huge boost to bottom lines: according to Goldman Sachs (GS), American firms are sitting on $920 billion in untaxed international cash. It remains to be seen just how much of this money will rain down on American shores, but as I said off the top, investors are sure to walk away with most of it. Because this is exactly what happened in the last repatriation, in 2004. Back then, 80% of the money brought home went straight into share buybacks, according to Bank of America Merrill Lynch. History is already starting to repeat. Because my first tax reform winner, Pfizer (PFE), a company I recommended on September 23 and is still a bargain at 13.9 times forward earnings, just rolled out $10 billion in buybacks (on top of the $6.4 billion it had already earmarked), plus a nice 6% dividend hike. The timing—just as the new tax bill became law—is no coincidence. If you’re worried you’ve missed your chance with Pfizer, don’t be, because the best is yet to come. As management rolls out the extra buybacks, they’ll drive up earnings per share (EPS), because there will be fewer shares to divide the profits among. And I know I don’t have to tell you that where EPS goes, share prices follow. But here’s what most folks don’t realize: buybacks also magnify dividend hikes, because they leave Pfizer with fewer shares to pay out on. To make the most of our corporate tax-cut windfall, we want to buy companies that are both buying back shares and hiking their dividends. But to make this maneuver really work, we need one more thing: a bargain valuation, because it never makes sense to buy an overpriced stock, no matter whether it’s you or management pulling the trigger. When you tick off those 3 boxes, you set yourself up for some enormous profits, just like we did with America’s biggest aerospace name 2 years ago. In December 2015, we added Boeing (BA) to our Hidden Yields portfolio because it fit our checklist to a T: it traded for less than 12-times free cash flow (FCF), and management was jumping on the sale price by repurchasing shares, slashing the company’s float by 11% since 2013. BA also had a repurchase authorization that would let it retire another 7.6%. 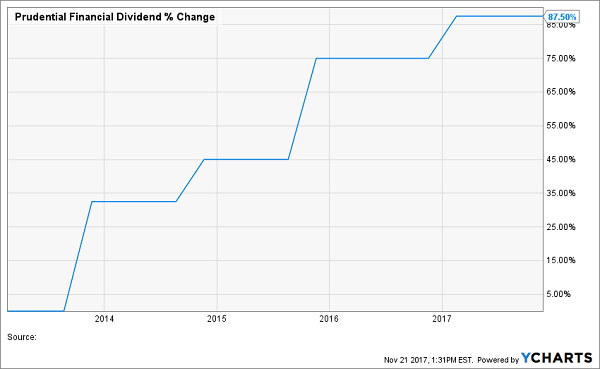 Then there was the dividend: in December 2015, Boeing was throwing off a nice 3% yield and had just rolled out a 20% dividend increase. When we added it all up, we knew we had a 10% to 30% gainer on our hands over the following 12 months. And as it turned out, we were right on the money. The firm went on to cut its share count by 7.4% over 2016, then hiked its dividend another 30% in December of that year. Here’s the thing: our formula worked too well, because BA was just getting started. 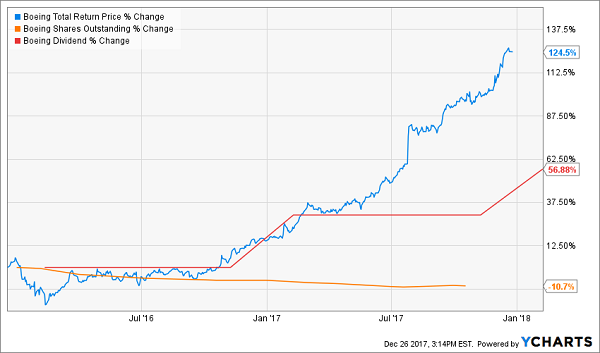 Like Pfizer, Boeing just announced a “tax-cut windfall” $18-billion buyback and another 20% dividend hike—leaving us with a 125% total return in just 2 years! 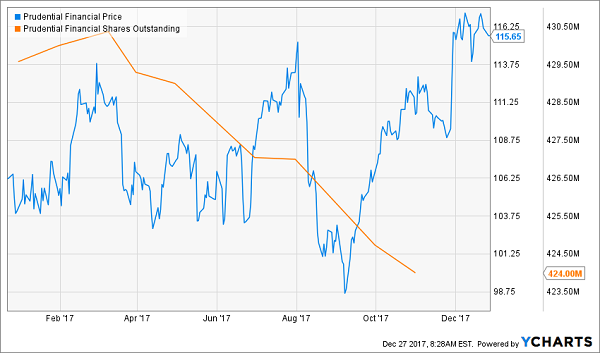 Take a closer look at this chart, and you’ll see that Boeing’s share price marched higher in lockstep with its two dividend hikes—with that big 10.7% drop in the number of shares outstanding pushing the stock higher still. 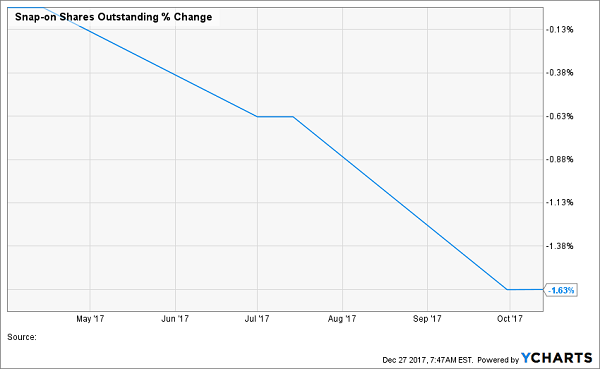 Here’s something else you should know, particularly if you’re frustrated with the pathetic dividend yields (1.8%, on average, as I write) the average S&P 500 name pays: thanks to that 57% hike in Boeing’s dividend over the last year, you’d now be getting a fat 4.9% payout on your original investment. Before we go on to the remaining 2 stocks I’ll reveal today, I must say that Boeing isn’t your best option for new buying now. With a big gain in the rearview, it now trades at 16-times FCF, the highest in 2 years, and is above my buy-under price. So let’s move on to 2 other stocks (in addition to Pfizer) ready to stuff their tax-reform winnings into our pockets. Prudential Financial (PRU): I wasn’t surprised to find the life-insurance giant on the list of companies rolling out fresh buybacks ($1.5 billion in PRU’s case) just as tax reform got the stamp of approval. Tax reform gives PRU another buy window, with the stock trading at a cheap 11-times forward earnings. PRU’s retirement focus (its Retirement Solutions and Investment Management business chips in most of its profit) sets it up to cash in as baby boomers clock out of the workforce. Snap-On (SNA) pays a 30% effective tax rate today, so it has plenty to gain as federal rates fall. That sets up the 96-year-old company, whose iconic trucks, which roll from auto shop to auto shop selling tools, for more buybacks to go with the $500 million worth it rolled out in August. The beat goes on: next year, analysts expect Snap-On to earn $10.95 a share, up 9% from this year’s forecast. SNA trades at a bargain 16 times that forecast. Snap-On has paid dividends every year since 1986 and even held its payout steady during the financial crisis—a rarity for an auto-related stock. Its payout has surged 115% in just the last 5 years and is plenty safe, accounting for just 29% of earnings and 33% of FCF. Grab this one now, before tax reform fires up its dividend even more. Dividend growth like you’d get from Snap-On (and even faster) is precisely what’s behind the portfolio I want to show you now: it’s a set of 7 ultra-conservative stocks I handpicked to deliver you 12% in safe, annual returns for life. 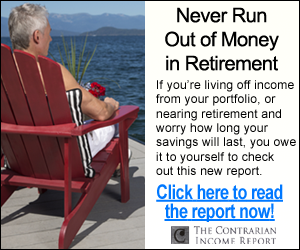 That’s 3 times more income than most retirement experts say you need! 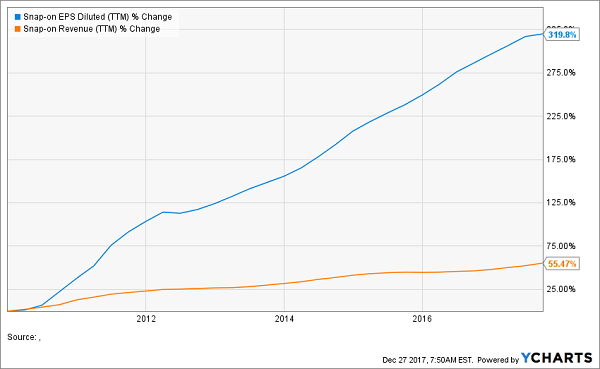 And that growth is set to get even stronger now that the tax bill is law—and will put a nice tailwind behind these 7 companies’ dividend growth. So what stocks am I talking about here? A stock that has already boosted its dividend payments more than 800% over the past 4 years and has at least another decade of double-digit growth left in the tank! 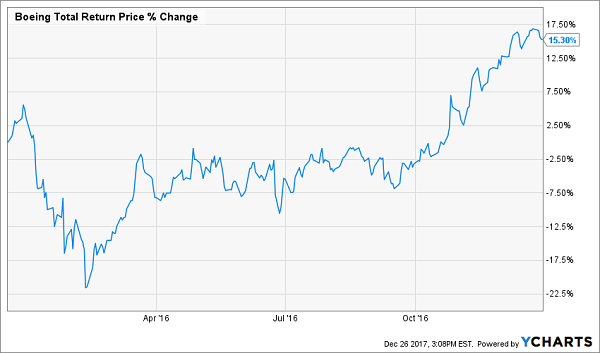 A “double threat” income-and-growth stock that rose more than 252% the last time it was anywhere near as cheap as it is right now! A 9%-plus payer that raises its dividend more than once a year—and will double its payout by 2021 at its current pace! This portfolio is perfect for retirement because it provides the best aspects of numerous types of investment strategies—income, growth and even nest-egg protection! And as I said before, it provides 3 times more income than most retirement experts say you need! 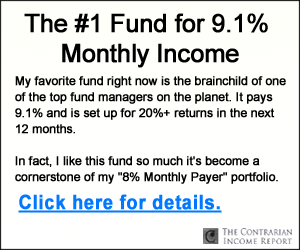 Let me show you the way to double-digit returns you can depend on. Click here and I’ll GIVE you 3 Special Reports that reveal how to earn 12% for life. You’ll get the names, tickers and my complete analysis of these 7 incredible dividend growers FREE!